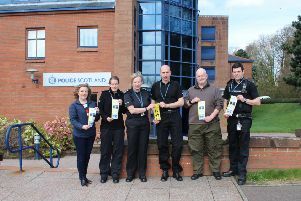 “If in doubt - keep them out” is the message Police Scotland wants the community to think about after cold callers to homes offering to carry out tarmac and driveway work. Complaints have been received about workmen inflating the final price after giving an earlier lower quote for the work carried out and false claims about the services actually being provided. Do not feel pressurised into agreeing immediate work. Never listen to scare stories and beware of traders who suddenly appear after storms, floods or even snow and avoid claims that a low price is only available if you sign up right away. Do not agree to buy from the first person who calls. Ask yourself if you really want these goods or services. Do not pay cash up front. Never pay for work before it is completed and don’t hand over large sums of money. Do report them. Don’t ever feel embarrassed if you feel you have been the victim of doorstep crime. If you feel threatened, unsafe or suspicious of a caller then contact police immediately on 999. If you see something suspicious in your area or want more advice on doorstep crime than contact police on 101, taking note of descriptions of people and vehicles used where possible. You can also contact police anonymously through the Crimestoppers number on 0800 555 111.